You’ve heard the saying that “breakfast is the most important meal of the day”, right? Well they weren’t lying – and what could be better than having someone else cook it for you. With that in mind, we’ve got six of the best places for breakfast in Nottingham – something to suit every budget. Whether you’re deep into your studies and need a full stomach to get you through, or you’re recovering from heavy night out, any of these fine establishments are guaranteed to set you right again. Let the countdown begin! It should be obvious from their name that this place does fine food, and in case you weren’t aware, they’ve got a little upstairs section for sitting and eating those fine foods. The brunch menu is where it’s at, with your classic breakfast fancied up with chorizo or the option to go outside the box with a frittata or two. Vegans aren’t forgotten either, with avocado bruschetta served with flair. Prices: Pretty much under a tenner for brunch, but you can splash out more on platters. The reason this establishment isn’t higher up the list is because they’ve recently moved from Pelham Street in the city centre out to the Forest Recreation Ground – which is a bit of a trek if you don’t live out that way. Anyway, with two locations in that spot – including the refurbed lodge – there will be a whole host of “brekkie” options in less busy surroundings. That includes pancakes, full cooked breakfasts and vegetarian breakfasts. Prices: To get their biggest breakfast you’ll pay only £8. Ok, so this is a chain restaurant, but they just happen to do a wide variety of good quality breakfast options right in the heart of the city centre, so don’t baulk at the faux-rustic interior. A great place to go if there is a group who all want different things, you can choose from a classic fry-up, buttermilk pancakes, granola, eggs and avocado and a number of other vegetarian options. Prices: With some dishes at £9.95, if you opt for extras you might spill over a tenner. You can’t beat an independent place carving out a niche for itself. Toast Deli & Cafe boast a whole range of locally supplied goodies – including doughnuts from Doughnotts! – so you can be sure you’re getting a quality breakfast. This is a great option if you want a filling breakfast without too much grease, providing gourmet versions of a Full English, or you can opt for pastries, bagels, waffles or muesli – you could even get a breakfast roll. Prices: A full breakfast might set you back close to a tenner, but there are cheaper options. Alright, so people have probably been banging on at you to try the burgers at Annie’s, but did you know they also provide a monster of a breakfast menu? We’re not talking burgers for breakfast either – this is the real deal, so prep your bellies. Tailored to the different areas of the states (it’s an American themed establishment) you can get some wild breakfasts here. From the Lumberjack with eggs, pancakes, hashbrown and sausage patty, to the Breakfast Burrito and the Homemade Biscuits & Gravy, it’s perfect hangover food if your plan is to simply sleep the rest of the day – the portions are very generous. Prices: The Lumberjack is £9.90 and the most expensive (but in fairness it’s so large it can feed two!) so you can work under a tenner, or go over if you’re looking for all the trimmings. Opening times: You can only grab breakfast here between 8am and 10.30am each day, so set your alarm! 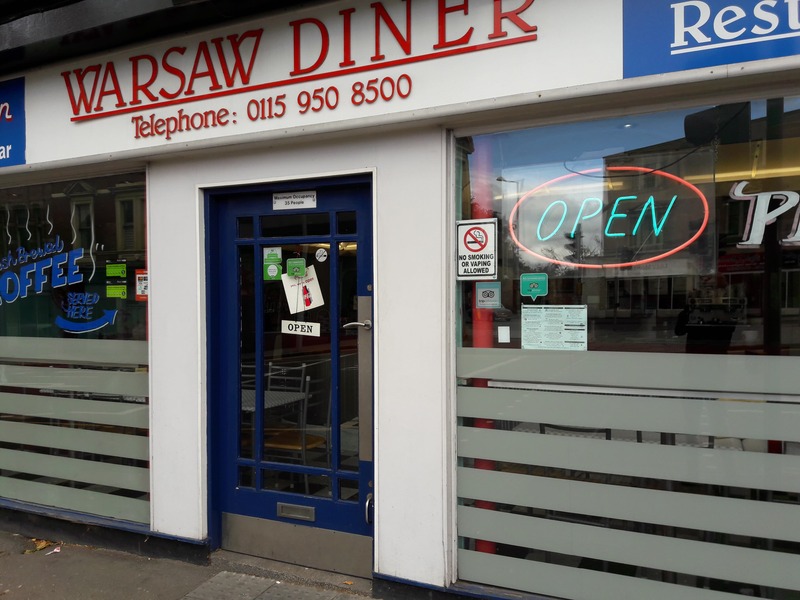 Just shading it for the top spot is Warsaw Diner, filling up bellies for years now with the perfect breakfast. You can get the works or just pancakes, along with perfectly scrambled eggs, the best bacon and hash browns in town. Basically, it does everything you want in a breakfast in the most perfect way. It’s a trek up the Derby Road hill but it’s well worth it – and you won’t be left too full afterwards either. The staff are attentive, but at weekends you’ll have to be early to get a table as it can get pretty busy, for obvious reasons. Prices: If you build your own breakfast – and you should – and you want a coffee, then you may well need more than a tenner.